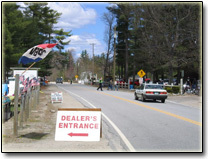 FLEA MARKET IN THE WORLD"
Does your yard sale bring in 1,000's of shoppers, ours does! 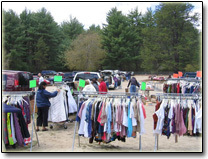 Host your next group yard sale at the Flea Market! Over 20+ acres, 1,000+ shoppers, hundreds of parking spaces, full concession stands, beer & wine, approximately 400 vendor spaces. We have so much foot traffic we need two Hollis police officers to direct street crossings. If any current dealer brings or refers another dealer to us, they’ll receive 50% off one space. No limit on number of referrals. 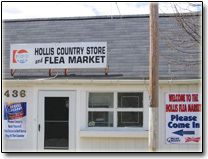 The Hollis Flea Market has a long-standing tradition of being the destination of choice for bargain hunters of all ages. In fact, we've been offering great deals on unusual and traditional merchandise longer than just about anyone. From one-of-a-kind things to new name-brand merchandise at HUGE SAVINGS, we've got something for everyone. Looking for a new and unique way to sell your wares? 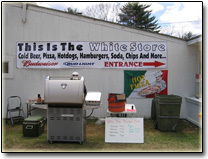 With guaranteed crowds who come with the intent to spend money, you'll fast see why most of our "first-time" vendors become "life time vendors." Simply put, we'll help you earn some fast cash on things you've got around, or help you to sell items as a regular Hollis Flea Market vendor! For more information about the Flea Market, Contact Us.